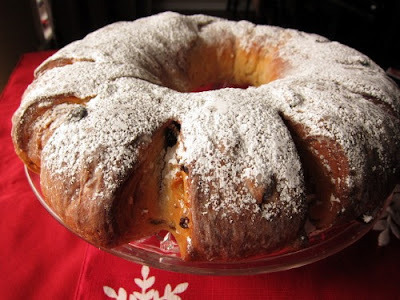 When I told my Oma (Swiss grandmother) that I was going to be making Stollen this year she was so excited. 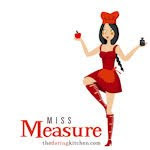 The 2010 December Daring Bakers' challenge was hosted by Penny of Sweet Sadie's Baking. 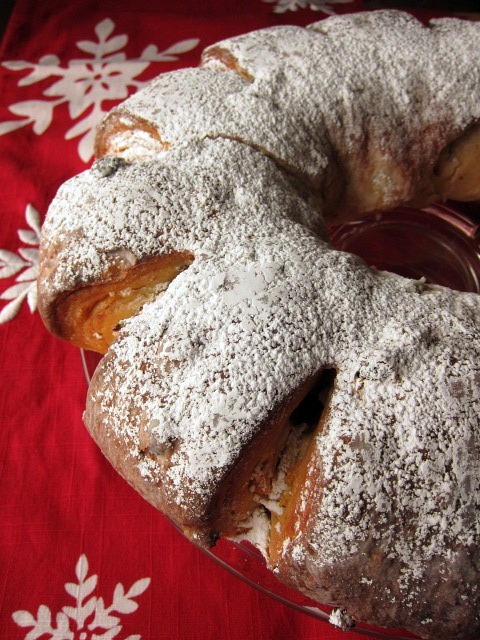 She chose to challenge Daring Bakers' to make Stollen. She adapted a friend's family recipe and combined it with information from friends, techniques from Peter Reinhart's book and Martha Stewart's demonstration. There are a few traditionally Swiss treats that my Oma makes every year during the holidays. If you're wondering what Swiss treats may be, think German but with a few twists; Swiss sweets are much like German sweets just don't say that in front of my Oma or any Swiss for that matter! A few years ago, when the baking bug was just a mere sniffle, I asked my Oma for a couple of her Christmas recipes. She agreed to give me the recipes of course, but with a catch: I had to bake them with her first so I could see exactly how they were done. So one chilly winter day in Northern Virginia, we spent a long afternoon making Viennese Crescents and Zopf (a post to come soon I hope). I think this might have been the afternoon that my love of baking started to grow into what it is today. 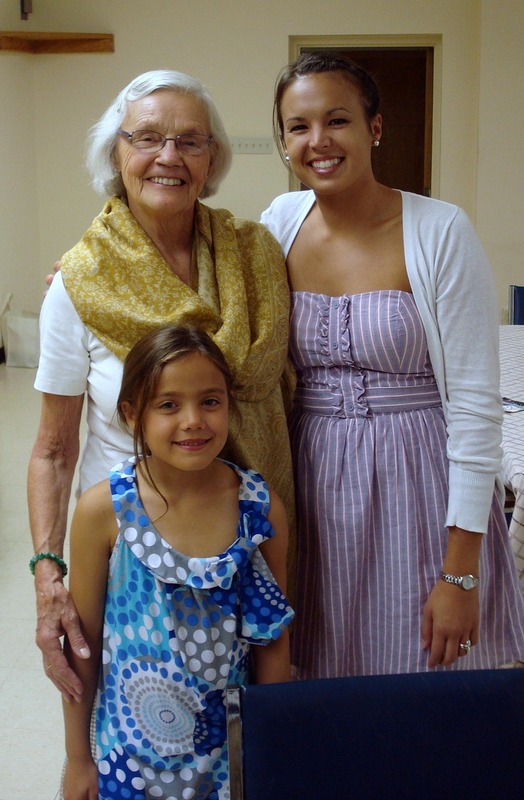 Now that I have a blog and have shared my love of everything baked to include the dream of opening a bakery one day, Oma is one of my biggest supporters. While home last weekend I overheard her tell my cousin (the gorgeous one below) that one day I would own a bakery with the biggest smile on her face. So back to the Stollen. I was lucky enough to get some of Oma's bread while I was home, even though she was hesitant to give me a loaf after I told her I was going to attempt my own. I assured her it would get eaten and also wanted to use it in comparison to my own. For this bread I used the recipe Penny gave us, but I would eventually like to get Oma's recipe as well. I can definitely see this bread becoming a Christmas tradition in our house now too. Soak raisins in 2 TBS rum and 2 TBS orange juice- set aside. In a small saucepan, combine milk and butter over medium heat until butter has melted. Let stand until lukewarm- about 5 minutes. Lightly beat eggs in a small bowl and add extracts. In a large bowl, stir together flour, sugar, salt, cinnamon and zests. With a paddle attachment (or stirring by hand), add yeast/water mixture, eggs and lukewarm milk/butter mixture. This should take about 2 minutes. Your dough should be soft, but not too sticky. Once the dough starts to come together, cover the bowl and let rest for about 10 minutes. Chop mixed candied peel into small pieces. Add mixed peel, raisins and almonds. Mix with hands to incorporate. Sprinkle flour on counter, transfer dough to counter and begin to knead dough (or use your dough hook to mix and distribute fruit evenly* I found the dough to be too heavy for the machine and it started making funny noises so I opted to do it the traditional way by hand), adding additional flour if needed. The dough should be soft and satiny, tacky but not sticky. You will know when the dough is done when a few of the raisins or peel start to fall off the dough and onto the counter- at the beginning of the kneading process the dough is sticky and the raisins are held in place, but once the dough becomes tacky the raisins will no long have anything to hold on to. Knead for about 8 minutes. Lightly oil a large bowl and transfer the dough to a bowl, rolling around to coat it with oil. Cover the bowl with saran wrap and refrigerate overnight (or up to 3 days). The dough will become very firm, but it will definitely still rise in the fridge. Take the dough out of the fridge and let rest for 2 hours in order to warm slightly. Line a sheet with parchment paper and set aside. Transfer dough to kitchen surface and punch dough down. Roll unto a rectangle about 16 x 24 inches and 1/4 inch thick. Starting with the longer side, roll dough tightly forming a long thing cylinder. Using kitchen scissors, make cuts along outside of circle, about 2 inches apart, cutting 2/3 the way through the dough. Mist dough lightly with cooking spray and loosely cover with saran wrap. Proof your wreath for about 2 hours or until its about 1 1/2 times its original size. *I placed my wreath in the oven so it was off the counter and in a warmer place. Remove wreath after 2 hours and preheat oven to 350. Bake stollen for 20 minutes, then rotate the pan 180 degrees and continue to bake another 20 to 30 minutes. The bread will bake to a dark color and should sound hollow when thumped on the bottom. Transfer to cooling rack and brush top with melted butter while still hot. Wait for a minute and tap another layer over the first. The bread should be coated generously with powdered sugar. Repeat this 1 or 2 more times. Let bread cool at least an hour before serving. Stollen freezes beautifully for about 4 months. The baked stollen stores well for 2 weeks covered in foil and plastic wrap or about 1 month in the fridge. 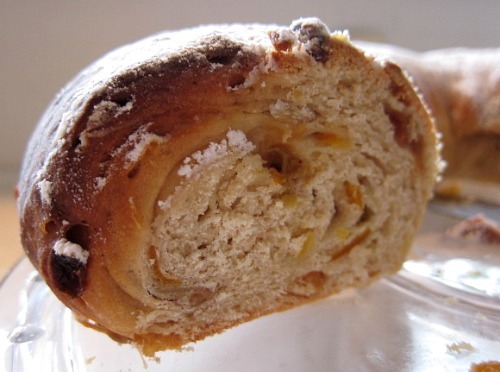 *Stollen toasts wonderfully and tastes great with a little butter and some jam! Don't Forget to Leave Some Cookies for Santa! Anadama Bread and My First Give-Away! !